Businesses across the UK are being wasteful. They are wasting energy and they are not being money-savvy, despite being in such tough economic times. Squandering valuable cash and energy is bad for the environment and your wallet. Besides, more and more consumers are choosing businesses based on their green credentials. 1. Print double sided paper. 2. Recycle plastic, glass and paper. 3. Turn all appliances off at the wall when not in use. 4. Shut the windows and doors when the heating is on. 5. Install solar panels on the roof for renewable heating and electricity. 6. Only fill the kettle with as much water that you need. Better still; replace it with a hot water dispenser. 7. Reduce paper use by emailing when possible. 8. Buy reusable filters for the coffee machine. 9. Purchase a water cooler instead of bottled water. 11. Use non-disposable cups, plates and bowls. 12. Buy from eco-friendly stationery suppliers. 13. 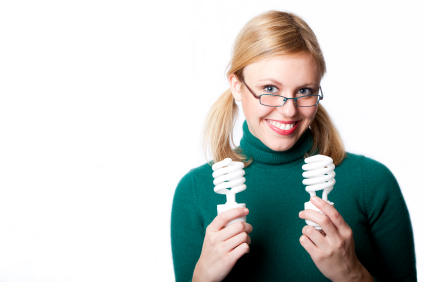 Swap the light bulbs for energy efficient ones. 14. Take out warranties when purchasing machinery and equipment. 15. Purchase sturdy, high quality tables and chairs that will last longer. 16. Buy milk and kitchen supplies like coffee and tea in bulk and when deals are on. 18. Share newspapers and magazines between staff. 19. Turn the photocopier and computers off every night instead of keeping it on standby. 20. Make sure the last person out switches off all the lights. 21. Turn the temperature down by two degrees to reduce CO2 levels. 22. If you have blinds, open them and let the sun in to heat the room. 23. Hire freelancers and contractors, instead of employing full-time staff. 24. Draught-proof around the doors. 25. Make sure all pipework and valves are insulated. 26. Install wall cavity insulation and insulation above false ceilings. 27. Encourage staff to be energy-efficient. 28. Use multi-function devices. A combo fax machine, printer, photocopier and scanner uses less energy. 29. Need to replace your office equipment? Why not recycle or donate your old office computer. 30. Encourage staff to car share to reduce car emissions. 31. Use VoIP for phone calls as it’s cheaper. So which of these 31 things will you be implementing in your office? It’s vital that you are frugal to save the environment and just think how much money you can cut back on spending! This article was provided by www.photocopier.org.uk , who can help you impartially understand the full spectrum of different office technology including photocopiers, multifunctional systems, utilities and consumables.